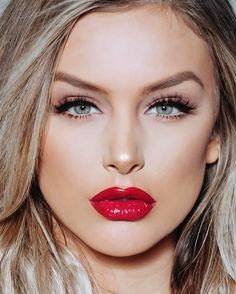 Lala Kent is an American reality television personality and model. She achieved recognition appearing on the reality TV series Vanderpump Rules. She portrayed Heather in the 2015 romantic film Pitching Love and Catching Fire and played Idaria in the 2015 action and comedy film Dudes & Dragons. In May of 2017, she released a single, called ‘Boy’. Born Lauryn Kent on September 2, 1990, in Salt Lake City, Utah, USA, to Kent and Lisa Burningham, she a younger brother named Easton. She moved to Los Angeles, California to pursue her career in the Entertainment industry. She started her career appearing in a couple of music videos and lower budget films before appearing on Vanderpump Rules. In 2016, she began dating Hollywood producer Randall Emmett. *She lost her father on April 23, 2018. *She was cast alongside Lisa Vanderpump on Vanderpump Rules. *She has makeup line product by her name ‘LALA’ which has cosmetic products from creams to glosses and mattes to bundles.